Are you more of an independent shopper or do you insist on getting help from a sales clerk? In the retail industry and consumer world as a whole, it’s important to cater to all different types of consumers. For most companies, combining new technologies such as self-service apps and kiosks with traditional brick-and-mortar shopping qualities is a no brainer. Research has shown that the next generation of shoppers is not shying away from these self-service merchandising experiences, so we should embrace it. At VPG we are elated to have played a role in the multifaceted path to purchase for years. 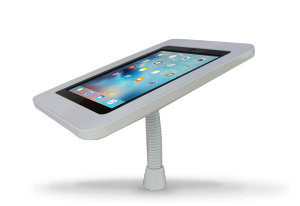 Our most famous self-service solution, the Gooseneck, promotes these new self-service technologies by allowing you to offer your customers Tablet and iPad access to internal systems. Restaurants, mall kiosks, libraries and even rental car brands offer self-service capabilities for check-in times, orders, directories, and more. The Gooseneck combines both flexibility and unique design into one perfect self-service security solution. The Gooseneck locks down your device and allows you to thread the manufacturer’s charging cable through its bendable stem, giving you the opportunity to have your device charged day in and out. Though flexible, the stem is made of cut resistant metal and provides the most durable security in the market today. Although the stem is strong, it is also narrow, saving you counter space for other products and displays. Because there is always something new coming out in technology, The Gooseneck was designed to save you money with its compatibility to multiple devices. 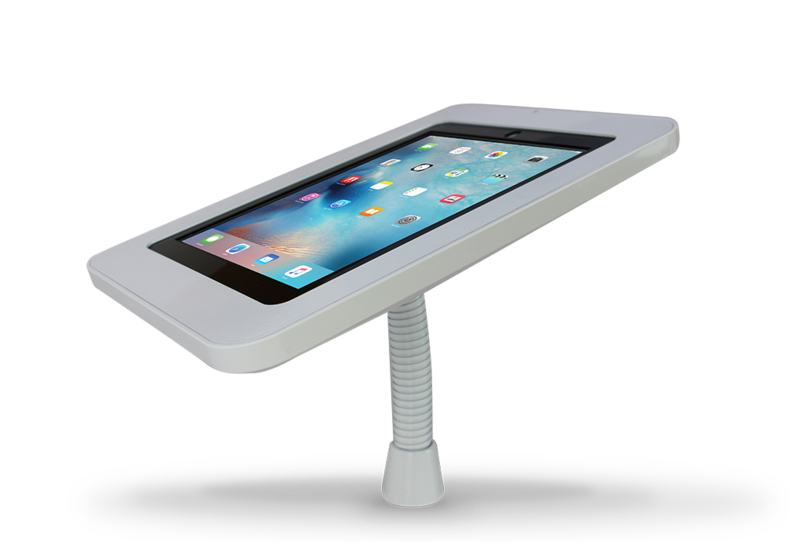 It can be re-purposed to fit another tablet, iPad, or eReader in seconds by switching out the custom interface inserts the fit your new device. Companies that focus on customer satisfaction and preference, such as self-service technologies, reap more from each store visit. Connect with your independent customers on a new level and provide a new in-store experience with the Gooseneck. Ask our solution specialists how you can order some for your stores.